Capsys Corp. was formed in 1996 to design and build Nehemiah II, 700 homes for the Nehemiah Housing Development Fund Company. Capsys won the prestigious "Build New York" award as well as HUD's "Innovation in Housing" awards for its approach and execution of the Nehemiah II project. Since then it has produced over 2,000,000 square feet and almost 2,000 units of housing in a variety of types, from low rise to mid rise homes, multi-family and hotels. Capsys' product requires a great deal of engineering and planning. This is one key to the quality of the product. All engineering and drafting are done in-house. Capsys is a union plant with highly skilled and motivated work force that takes pride in the company's product. Capsys' steel structural system, which still is unusual in the industry, has evolved into one that is completely fireproof using structural steel and concrete. It is, in fact, the state of the art in prefabricated construction. The company is a subject of interest on a national basis for its atypical approach of using a steel-based system with production line techniques. It has been the subject of a number of different studies as well as magazine and newspaper articles. It regularly conducts tours for various academic, professional, manufacturing and technical groups from all over the world. Capsys mission is to deliver a modular construction that gives owners and developers advantages in speed, efficiency, impact sustainability and cost. By using our proprietary system that operates in a controlled environment, demands best practice workmanship of its tradesmen and maintains rigorous quality controls, Capsys helps clients meet aggressive timelines, energy-efficiency benchmarks and budgetary goals, all while providing superior quality construction. The Capsys’ system of modular construction is unmatched in the industry and we are a nationally recognized leader the field. 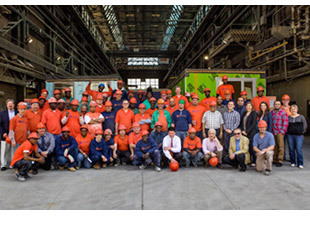 The Capsys system of modular construction allows for an efficient mix of manufacturing the modules in our Brooklyn facility simultaneously with site preparation work being performed on-site. This parallel approach to constructing the building will allow for the overall design and construction period to be reduced dramatically. Capsys modular units contain a suite of noncombustible materials including structural steel, light gauge steel framing, concrete floor structures and fire-rated gypsum wallboard. Capsys vast experience with code-compliance and effective value engineering make Capsys an integral member of your design and construction team. With the advantages of the highly controlled and structured environment of our plant the finished products arrives on-site virtually complete and of the highest quality. We stand behind our modules and thrive for continuous improvement in all aspects.